A lovely holiday house in the centre of the harbour town of Harlingen. The house has a spacious living room, a modern kitchen with a Nespresso coffee maker, one bedroom with a double bed and an en suite bathroom, plus a bunk bed in the hall for the kids. This is a great place for 2 adults or a family with 2 children to spend an enjoyable holiday. You will find plenty to do for all ages in Harlingen. You can take some lovely boat rides on the canals and visit the lighthouse or the beach at Harlingen. 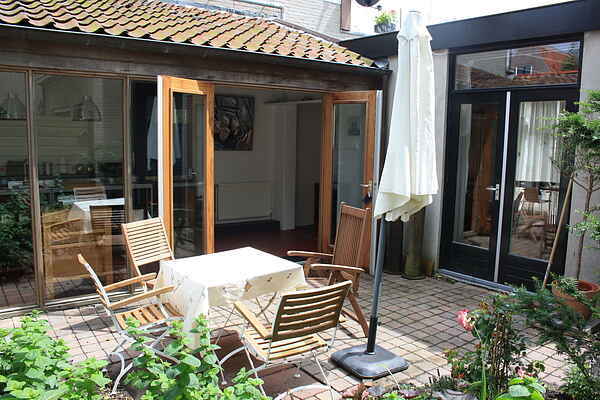 And your stay would not be complete without a day on the island of Terschelling or Vlieland. Other excursions include mudflat hiking and seal watching. Harlingen is on the famous Elfstedentocht route, which traverses eleven historic Frisian towns and can be experienced by bike, boat and even classic car. Aqua Zoo Friesland in Leeuwarden, the Planetarium in Franeker, the skating museum in Hindelopen and the maritime museum in Leeuwarden are all close enough to visit. There are also a number of cities worth visiting in the area. Spend a day shopping in Leeuwarden or visit the historic city centre of Sneek. You are required to bring a basket, blanket or pillow for your pet.